MDI-DE aims to provide data and information coming from coastal engineering, coastal protection, marine environmental protection and marine nature protection via a joint internet portal. Metadata and web-services support the search for data and their use. The database helps German administration to fulfill reporting for EU directives like MSFD and INSPIRE. MDI-DE was funded by the German Ministry for Research (between 2010-2013) supported by eleven authorities of the Federal Government and the Federal States. Since April 2014 MDI-DE is continously developed as VKoopUIS project. Which kind of metadata are available for the German North and Baltic Sea region? How MSP relevant spatial data can be efficiently managed and shared among stakeholders and with other web data tools and platforms? How can MSP related spatial data and metadata be structured according to the requirement of the INSPIRE Directive? Current questions related to changes of marine ecosystems, global warming and the resulting requirements for costal protection as well as reporting obligations of the European Union with respect to effective frame- work directives (INSPIRE, MSFD, etc.) require interdisciplinary access to the related spatial data. Therefore an integrated national marine and coastal information system was set up within the co-operative project "Marine Data Infrastructure (MDI-DE)". Coastal and marine data collected by 11 Federal and State agencies are made available by OGC (Open Geospatial Consortium) compliant Web services and documented with metadata according to the ISO standard. The MDI-DE portal serves as central entry point for data and information from the German coastal zone and the adjacent marine waters. This facilitates intersectoral views of resources by providing technological solutions of net- working and distributed data management. The benefit of hosting the data locally is that the data from different sources can be merged in almost any way, custom-made compositions of thematic data layers can be compiled without touching the data itself. Each participating agency or institute operates a node which consists of a few basic components: ser- vices to provide the data, metadata and a database. For the provision of spatial data, the OGC has de- veloped a number of open and international standards. The Web Map Service (WMS) to generate and visualize digital maps in the Web and the Web Feature Service (WFS) to download the data in an in- teroperable format such as GML (Geography Markup Language). The underlying database needs to support these services. After thus ensuring the data distribution, the last piece of the puzzle is the corre- sponding metadata which are harvested from the different local nodes and are provided through a stand- ardized Catalogue Service for the Web (CSW) interface. Beyond the basic services such as WMS and WFS, a Web Processing Service (WPS) for data analysis was implemented (see Figure). MDI-DE represents not only a state-of-the-art spatial data infrastructure; it also aspires to lose the ‘spatial-only’ attribute and includes other related data into this distributed data source. The future Web- Services provided by MDI-DE will support system analysis applications related to coastal engineering, spatial planning, nature conservation, science and ecology. The software used in the MDI-DE Data Portal is free and open source, thus allowing the transparency and reproducibility of the process. The products (maps, graphs, reports) can be used to support studies and planning in various case studies in the Baltic Sea Region and can be used as examples for similar approaches in other countries/sea regions. 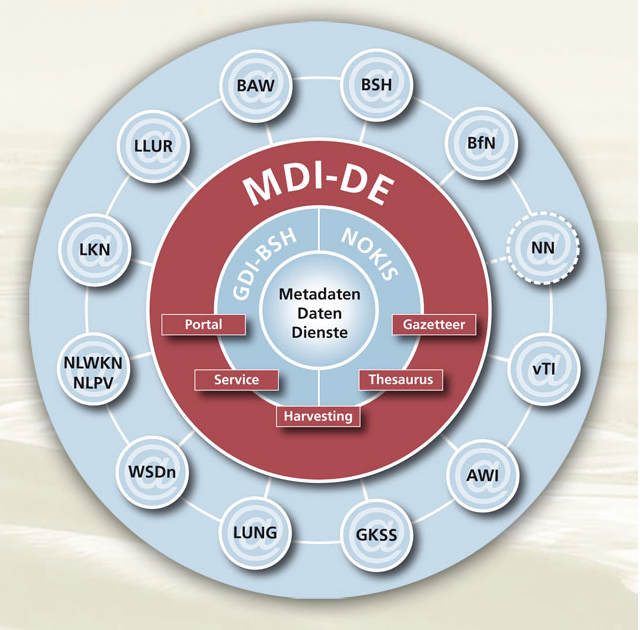 MDI-DE was funded by the German Ministry for Research (between 2010-2013) supported by eleven authorities of the Federal Government and the Federal States.